This track consists on finding alignments between the Environment Ontology (ENVO) and the Semantic Web for Earth and Environment Technology Ontology (SWEET), and between the Flora Phenotype Ontology (FLOPO) and the Plant Trait Ontology (PTO). These ontologies are particularly useful for biodiversity and ecology research and are being used in various projects. They have been developed in parallel and are very overlapping. They are semantically rich and contain tens of thousands of classes. The preliminary results have been generated and are available now (03.10.2018). Link to results page. Dataset can be dowlowded here. You can either download and try it on your own or directly use SEALS platform. Both options are possible, however finally you have to wrap your tool against the SEALS client provided via the OAEI main page . 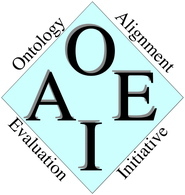 The schedule is available at the OAEI main page. We would like to thank Marco Schmidt and Claus Weiland (FLOPO) who provided us with manual mappings between the FLOPO and PTO ontologies. We would like to thank Melanie Buss (PANGAEA) who provided us with manual mappings between the ENVO and SWEET ontologies. The track is partially supported by the AquaDiva project.